I got to cross another location off my bucket list by volunteering at CSSDevConf this week – New Orleans! Over two days, the other volunteers and I showed guests around the Hotel Monteleone in the French Quarter and were able to attend sessions and keynote talks when we weren't on shift. The lineup of speakers was an absolute dream. Mina Markham opened the conference with her Pantsuit Design System presentation – a little remix this time, called “Saving the World with CSS”. It was just as moving as the first two times I saw her give it. Everyone cried. Standing ovation. The usual. Chris Hawkins gave a presentation on "Removing Unwanted CSS" from a web project which was really applicable for me and challenges I face on a daily basis. I work with legacy code that's been in the hands of multiple developers, and although some of the strategies discussed are only doable with a larger front-end team, it was helpful hearing how to actually work through these things. Dave Rupert hosted a session called "Let's Talk Burnout", which turned into a group therapy session that I think we all really needed. Hearing struggles of others and their coworkers helps us realize that it's not the first time someone experienced the things we feel when it comes to working in our field – some have felt it much more deeply. We shared coping mechanisms and strategies for seeking help if needed, whether amongst our family, friends, and peers or professionally. A reoccurring thread through many of the talks was the topic of performance. I had seen presentations in the past on performance, but they mostly circled around process and were heavy on the technical aspect. Jason Pamentel spoke specifically on the topic of variable fonts and how typography on digital systems is a very different animal. Performance has to be the first design consideration in any project because simply put, if it doesn't show up, nothing else matters. Harry Roberts dove into some more tactical solutions in his keynote including some easily accessible competitive tools, real stories of why speed matters, and how to make performance a priority. You have to understand that you know what you know. You've worked hard at building up a skillset. You got the job done and keep getting paid, so you must be doing something right. So someone is recognizing that you did the skills you said you could do. Almost everyone suffers from imposter syndrome. You need to realize that there are people who are actually imposters. This means you know you don't know everything and is a good thing as long as you don't let it wear you down. If you think you know everything, you stop learning. We never get over it. The thing that helps me speak with authority is that everyone is a specialist in something. It feels like everyone knows so much stuff, but I'm the expert on making tables. Even though I may not know as much as I would like to, I am proud of the things that I do know about. Take comfort in that you have gotten good at something, and that you can get good at those other things. It doesn't matter how long you have been in the industry. The only way you can get up in front a room to come in a room and say something of value. I always try to focus on hoping that someone is going to say something in a Q&A will teach me something. This makes it better because this keeps you honest and helps with burnout because you know you'll get something every time you give something. These events really keep me happy in my job. I'm actively having imposter syndrome as I sit here next to Harry Roberts and in disbelief. The way I dealt with it is that I reminded myself that I was hired for a reason and that I'm still here. So I drowned the outside noise of measuring yourself against someone else. That was a big lesson to just focus on what you know how to do and that you are accomplishing the task I was given and that people are happy with the work that I am doing. It was an honor to be chosen as a volunteer for CSSDevConf and I hope to be able to help in future years. Ari and Chris have created an amazing community and this event is really something special. 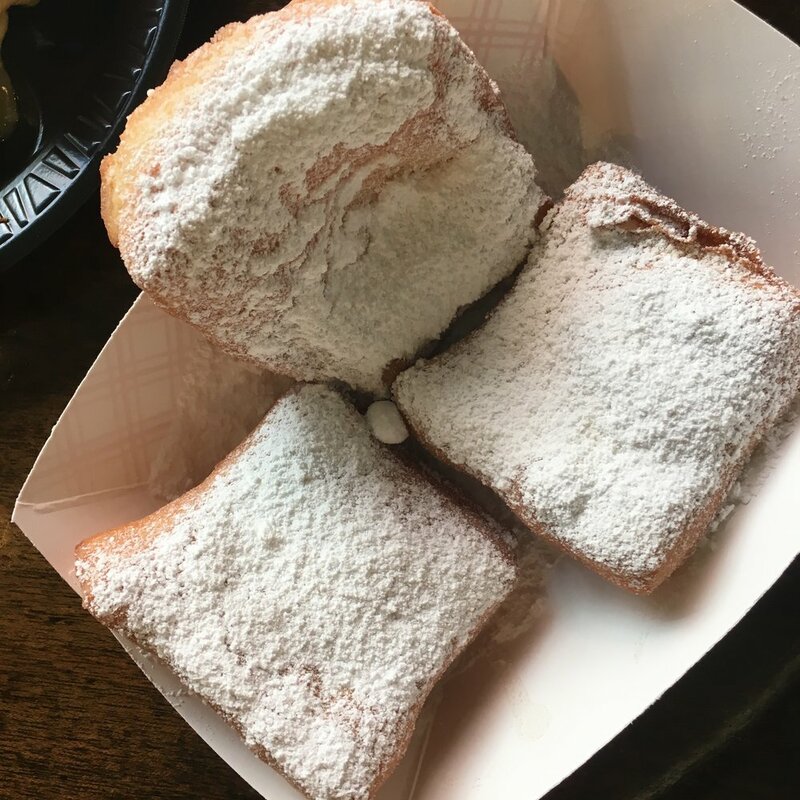 I left feeling refreshed, excited to share what I learned, and of course, full of beignets.